The United States ambassador to Nigeria, Mr Stuart Symington, spoke when he paid a visit to Governor Abiola Ajimobi in Ibadan - Mr Symington said the United States was interested in Nigeria and this was why he was visiting states within the country The United States of America has spoken about Nigeria as the latter continues to battle with agitations from the south-eastern part of the country for secession. According to the US ambassador to Nigeria, Mr Stuart Symington, the foreign country and one of the world powers would continue to support Nigeria’s unity. Symington said his country will continue to work towards the promotion of unity in Nigeria. 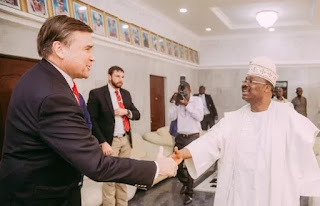 Vanguard reported that the ambassador made this known when he led top officials of the embassy on a working visit to the office of the governor of Oyo state, Senator Abiola Ajimobi, in Ibadan. The envoy said that the US recognizes the strategic importance of Nigeria in Africa, adding that his visit was in the furtherance of his country’s mission to explore new frontiers of partnership for development with African countries. This is why, he said, he was touring every part of the Nigeria. He urged the government of Ajimobi to work with the US towards setting a new pace in socio-economic development. “This visit is not just a courtesy call; It is in continuation of America’s vision and mission. We are looking forward to working with your state to set up a new pace in development. “We are happy to be here and I’m telling you that Nigeria as a country is loved by all Americans and even in the world for the sake of the unity the country uphold,” he said. He said technical education was necessary for the country’s accelerated development. Meanwhile, despite the hues and cries that greeted the three months quit notice given to Igbos by Arewa Youth Consultatives Forum (AYCF), a Coalition of Northern Youths has written a letter to the Acting President, Yemi Osinbajo, begging him to allow Ndigbo to go and have their Biafra Republic. In a statement sent to NAIJ.com, a Facebook user, Yazid Ahmed said the group lauded the peace and conflict resolution moves being done by the Acting President, but noted that it doubted the efficacy of it in bringing a lasting solution to the proble.